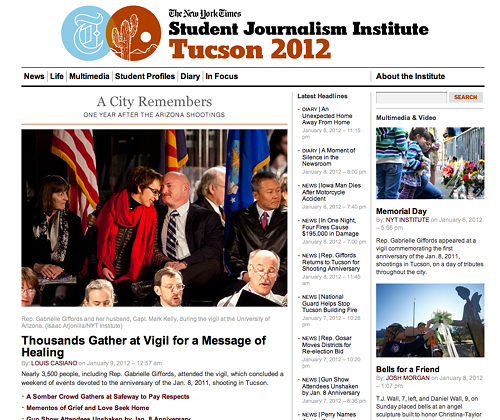 The New York Times Journalism Institute was held twice-a-year, alternating Januaries were spent at the University of Arizona in Tucson, Ariz., and Florida International University in Miami, Fl. As a member of the Tucson institute faculty, I was served as a technology liaison between the UA’s technical support team and the Times staff, I also served as a mentor on the web, multimedia, photo, and design desks. In 2012, one of my duties as a local institute staffer, I also helped students with their story ideas and getting around Tucson.